The accident happened between hours of 9am and 10am on Wednesday, 12th September, 2018 at the Ebeano Tunnel, off Okpara Avenue, Enugu State. The tragic event involved one red Honda (End of Discussion) which had only the driver as its occupant. The report reaching says that the driver was seen to be in total loss of the steering and veered off his lane with great speed into the opposite lane, hitting down a street light and then smashed onto a high tension electric wire pole (Twin Pole type). Fortunately for the driver, the electric current flowing through the wires on the poles were miraculously seized shortly. This immediately gave way for prompt rescue to be given to the injured driver. The middle-aged man sustained some bruises on the forehead and chin and was unconscious. It’s worthy to mention that the driver was on his seat belt. Damages to the car include; deformation of the rim, total wear-off the front bumper, damage to roof and shooting out of the SRS airbag. 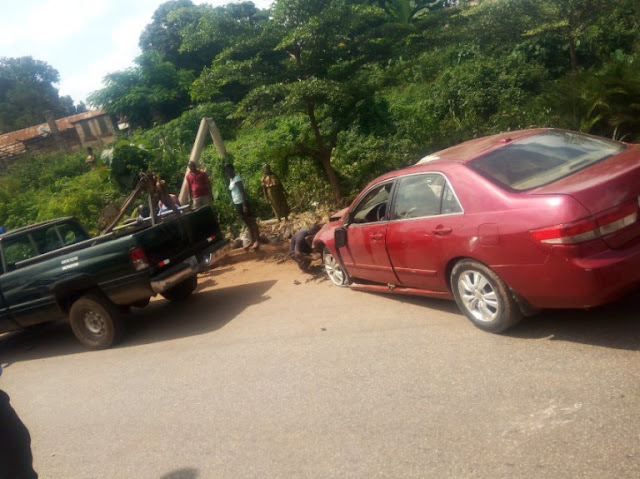 The injured driver is currently undergoing treatment at the Enugu State Teaching Hospital, Parklane, Enugu. The accident restricted the flow of traffic on the road, which was a double lane, to single lane traffic. Aside this little disruption, traffic is moving smoothly as security agents and EEDC have taken control of the scene. The high tension wires have been temporarily dismantled and the vehicle is being towed off as at the time of this report. Thanks to Mr. Ogbuagu Chiedozie Collins who reported this to Autojosh. He as well took pictures of the accident scene.